specializes in Mizong Quan, which was passed down by his coach Master Ye Yuting who came from Cangzhou China to Hong Kong in the 1940s. Driven by the mission to safeguard the cultural and practical essence of Chinese wushu, Hung made Mizong Quan (punch) and another wushu originated in Cangzhou, Tipao Jian (fencing), listed on the First Intangible Cultural Heritage Inventory of Hong Kong. 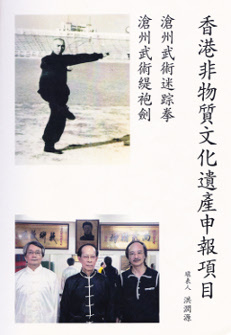 (1st generation successor descending from Master Ye Yuting,Cangzhou Mizong, Convenor of Wushu Culture Resource, Life Achievement Award of World Organization of Wushu Kung Fu Masters, Accredited Coach of Hong Kong Coaching Committee, SanSou Coach, Chinese Traditional Wushu Umpire, Former Lay-Lecturer (First Aid) of St John Ambulance Brigade). Wushu Culture Resource (also known as Intellects Culture of Hong Kong China), operated by Tiglion Consultancy Company Limited (TCCL), is a strategic alliance of Chinese traditional martial arts masters, highly skilled artists of the performing arts, academicians, and professionals from various disciplines of business fields. Having been the pioneer of a newly combined talented sector in Hong Kong, it is a spearhead in the promotion of Chinese martial arts and culture. TCCL is listed as a Stakeholder Group for using Theatres in West Kowloon Cultural District and Wushu Culture Resource is a course provider in the databanks of Hong Kong Education Bureau for providing courses in the areas of LWL Life-wide Learning Activity and OLE Other Learning Experiences for primary and secondary schools. Wushu Culture Resource bears a vision to reinvent traditional Chinese martial arts and culture as a cultural and creative industry in Hong Kong, of which aligns with China Twelfth Five-Year Plan to promote cultural industries substantiated by the fact that there are over 129 items of martial arts having been listed as Intangible Cultural Heritage of China. Wushu Culture Resource endeavors to provide the building blocks of reinventing martial arts and culture under the framework of cultural and creative industry in Hong Kong. This platform aims to nurture and sustain the development of learners, teachers, audience, and practitioners of martial arts and culture so to build a framework that will bring along not only competitive edges and job opportunities, but also shared values to the society at large. Tiglion Consultancy Company Limited was founded in 1988 and assumes the role of an on-line transaction carrier and developer for e-marketing applications and systems since 1990's. Successful e-business transformation and on-line transaction processing solutions branded under travel.com.hk for travel services, insurance.com.hk and insurance.net.hk for general insurance products are literal real-life business models. With possession of advanced technological infrastuctures, proprietary intellectual assets and knowledgeable e-business experience, TCCL now makes available a e-business transaction platform for innvoative performing artists, products and services providers, and wushu coaches to put across information about their products, services and expertise through Intellects Culture of Hong Kong, China at www.intellects.org to all people and places everywhere in the world.